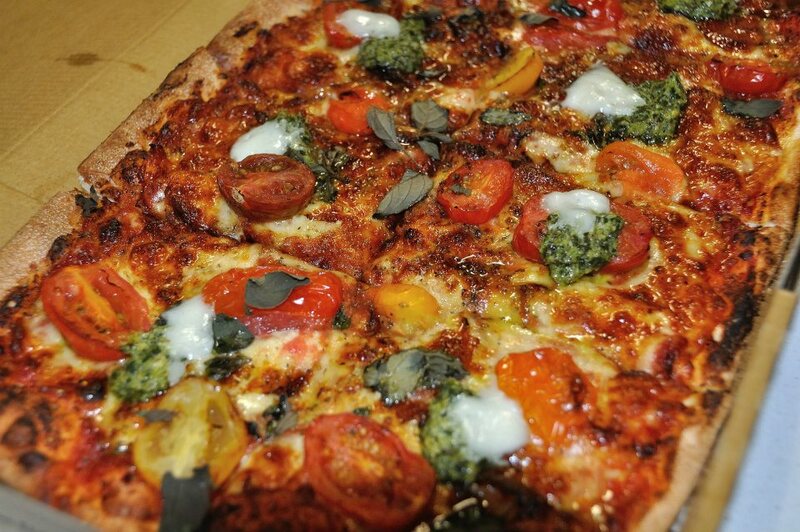 For Crust fans there is a new addition to the menu which pays tribute to the lovely seasonal produce that is currently available…… introducing the Heirloom Tomato Upper Crust Pizza! The new Heirloom Tomato Upper Crust Pizza begins with a tomato base delicately topped with a vibrant mix of green, black, red and orange Heirloom tomatoes, each of these beautiful tomatoes are packed full of flavor each tomato varying from bitter to sweet and soft to hard. It is then complemented with a combination of smoked, buffalo & cured mozzarella. All cheeses are locally sourced with the smoked mozzarella coming from Paesanella in Marrickville, an Australian family-run company that has been making the freshest cheeses since 1959. The finishing touches are added, with oregano verde (an oregano-based salsa verde), plus fresh and dried oregano. This balanced blend draws all of the components together to perfectly finish the pizza. 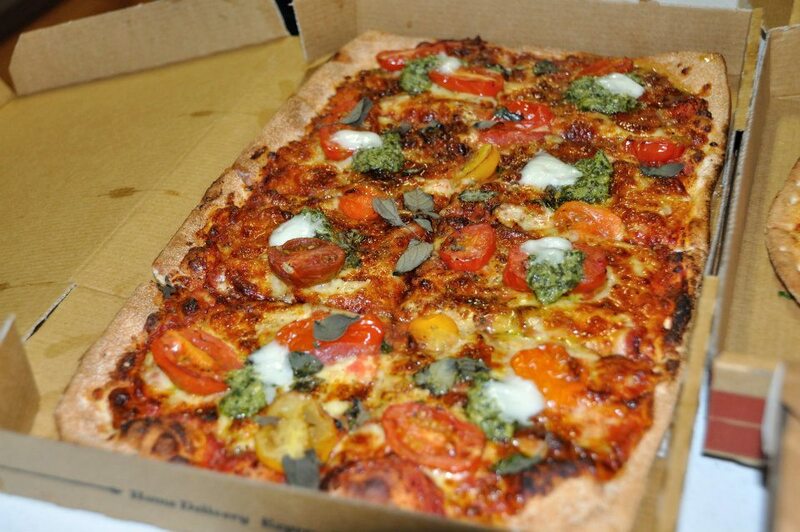 Having sampled this pizza the other night, I am a big fan – the sweetness of the tomatoes contrasted so nicely with the oregano verde! Classic ingredients done well on a beautiful base. All responses will go in a hat, with the winner to be announced on Sunday, Nov 11th. Vouchers will only be valid at WA stores. Valid Monday – Thursday. Offer expires 13/12/12. Only for store and pick-up orders. Can you please indicate your preferred store when you enter. I’d follow up the heirloom with the Peking duck and then the hokey pokey calzone. Likely to never move again after that… Ha! Our closest store is Victoria Park. After the Heirloom Pizza, we’d try the Moroccan Lamb followed by the Hokey Pokey Calzone…with caramel and hazelnuts…..then we’d be stuffed! I would be following with a caramelised fennel salad and to finish off…. off to the ocean with a Seafood Pizza! Delisizio!! And only a hop skip and a jump to the Mt Lawley location. After that terrific tomato treat, I’d be hanging out for that incredible Wagyu Prawn, then finish with the decadent Rocky Road. The Heirloom Tomato looks delish, after that I would be devouring a Sausage Duo from Mt Lawley Crust, followed by the Rocky Road Calzone. Haven’t tried any of the dessert calzones yet. Seeing as we are going all out for three courses after the heirloom tomato entree it would be onto Peking duck for main and hokey pokey dessert! definitely the Mediterranean lamb next and then probably hokey pokey calzone although as I am on a gluten free diet I would try the chocolate mousse while the rest of the family ate the calzone. We will be trying this friday night. Thanks to the Food Pornographers hot tip. I’ve been meaning to try Crust for ages! I would start with the delicious Heirloom Tomato entree (all to myself), enjoy the awesome flavours of the Vegetarian Supreme (the Pesto Aioli is to die for) and finish off with the oozie-goo-iness that is the Hokey Pokey Calzone (that notoriously oozes everywhere)… & I’d get it all from the great folks in Mt Lawley. The Wagyu Prawn sounds amazing and perfect for meat eater me and prawn man hubby. Hokey Pokey Calzone will be a great ending to all. Based on experience, I would skip the vic park branch and head right away to the one in Mount Lawley.